Installing laminate under dishwashers is something you may across when installing your laminate flooring in a kitchen. Dishwashers are usually installed in an opening between the kitchen cabinets. The space can be kind of tight. When installing the laminate under the dishwasher, you have to pay attention to the height of the opening. The reason I say this is because the laminate has to be installed under the front legs of the dishwasher. If you don't install the laminate under the legs, you may have a hard time removing the dishwasher or not being able to remove it at all. The laminate flooring will be in the way if you ever have to replace it in the future. Its not necessary to remove the dishwasher when installing laminate flooring. To remove it would involve disconnecting the water feed line, the water drain line and the electrical wiring. Most dishwashers have adjustable legs in the front. When installing the laminate under the dishwasher you will need to pay attention to the top of the door. 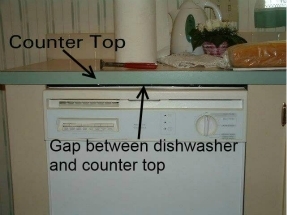 If the dishwasher is lifted up too high, then the door may hit on the edge of the counter top. There were times when the opening wasn't tall enough for me to install the laminate under the front legs. One time in a mobile home I had this problem. I told my client about it. He said, well if I have to replace the dishwasher I will just cut a hole in the outside wall and take it out that way. Sounds like a lot of work to replace a dishwasher, I guess he really wanted the laminate flooring. First thing to do is to remove the front plate from the bottom of the dishwasher. Most of the time there is 2 screws that hold it on. There are usually two parts to the front plate. You will have to remember how they come off so you won't have problems when replacing them. Once the front plate is removed look at the legs of the dishwasher. They are most likely the type that screw in or out. Turn them clockwise to screw in and counter clockwise to screw out. Most likely you will have to screw them in to make room for the laminate flooring to slide underneath. I use a pair of pliers when I do this. They can be hard to turn sometimes if there old. 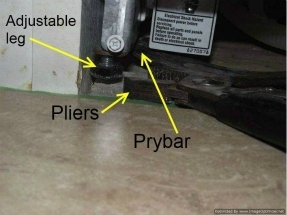 Most of the time I use my pry bar to lift up the dishwasher so I can get a hold of the leg. I put something like a scrap of flooring underneath the frame of the dishwasher behind the legs. This holds it up so I can adjust the legs. You can leave the scrap of flooring there also while installing the laminate under the legs. When your installing laminate under dishwashers, lay the laminate far enough back so when you put the front plate back on it looks like the dishwasher is sitting on the laminate flooring. I usually lay the laminate a couple inches in past the the bottom of the cabinet.